I went to the Gordon Parks Centennial Exhibition at the Jenkins Johnson Gallery with my indomitable treasure of a friend, Liz. If you can’t go with Parks – who died at 93 in 2006 so we’re out of luck there – Liz is a close second best. 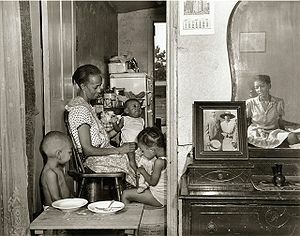 The show itself is a treasure trove, with groups of black-&-white photographs offering glimpses into the incredible breadth of his work, from overlooked victims of poverty and racism in mid-20th century U.S or in the favelas of Brazil (taken during his time first with the Farm Security Administration, then for many years with Life magazine) to stunning fashion photos for Vogue to portraits of celebrities, athletes, World War II Tuskegee Airmen and ordinary people you wish you could have known. When you meet them in Parks’ photos, you do know them. Liz married Parks when she was 23 and he was roughly twice that age, a marriage that lasted for nearly a decade. It was at a time when he was already well known for his work for Life and Vogue, and just beginning to branch out into writing. He would also gain renown for films – documentary and commercial, best known of the latter being “Shaft” – and music – a piano concerto, a symphony and a ballet which he also choreographed – and romantic involvements – most notably with Gloria Vanderbilt. My guess is he just loved gorgeous women who had more than a little pizzazz, and who can blame him; he was ruggedly good-looking himself on top of that bewildering assortment of gifts. He and Liz remained close until his death. What was such fun about roaming the show with Liz was feeling able to peek inside the psyche of an artist so multi-faceted, while marveling at one facet, Parks the photojournalist. Liz wasn’t telling family tales, just dropping side observations about the times that set me wondering: was he just a little worried, perhaps, about his beautiful young wife talking too much to Marlon Brando at a party she was hosting? Or going to another party in New York while he was on assignment in L.A.? Could he have been, really!, a bit too immersed in an assignment (I was gazing at the resultant photos) when he dropped that young wife off at the hospital because their baby was about to be born? In short, the man who gave the world such insight into the human condition was human just like the rest of us. It’s a pleasure to be part of the same human race. But what a superhuman talent, and what a rare glimpse. Thanks, Karen Jenkins-Johnson. Thanks, Liz. Waiting lines at the bathroom? Overflow in the kitchen cabinets? Welcome to the suddenly multi-generational family home. Welcome to the brave new world of extended-family housing. “The Waltons are back,” said Paul Taylor, executive vice president of the Pew Research Center, which conducted the analysis. Multigenerational families, which accounted for 25 percent of the population in 1940 but only 12 percent by 1980, inched up to 16 percent in 2008, according to the analysis. For the rapidly growing 65+ segment of the population, there’s good news and bad news in this. Loneliness is often cited as a great fear among the aged. At talks and workshops this writer often does on end-of-life issues (advance directives, end-of-life choices, etc.) the response to any “What do you fear most?” question is never “death,” almost always “pain,” “isolation” or “loneliness.” When younger generations move in, loneliness is unlikely, but other problems may well take its place. The analysis also found that the proportion of people 65 and older who live alone, which had been rising steeply for nearly a century — from 6 percent in 1900 to 29 percent in 1990 — declined slightly, to 27 percent. At the same time, the share of older people living in multigenerational families, which plummeted to 17 percent in 1980 from 57 percent in 1900, rose to 20 percent. While the pre-World War II extended family may have been idealized as a nurturing cocoon, the latest manifestation is too recent and a result of too many factors, positive and negative, to be romanticized. The decline of extended families coincided with an exodus to the suburbs, where many young adults preferred to raise their children, and the enactment of Social Security and Medicare, which made older adults more financially independent. Households With Extended Families Are on the Rise, Census Shows – NYTimes.com. It gets worse. After yesterday’s post, in which the linking of abortion to “Black Genocide” by Georgia Right to Life was reported with sadness and a little rage, I received a link to a story in the European edition of Telegraph U.K. It concerns a newly launched campaign to link abortion in Poland with Hitler’s extermination of Polish Jews. It reaches a brand new low. Accompanying the article is a large, color photo of the poster which is at the centerpiece of this campaign. A leering Hitler, two horrific pictures. You may or may not want to read the Telegraph story or view the nightmare-producing poster. You are probably not old enough to remember Adolph Hitler, but I am. His images were all over the newsreels of my childhood. My father woke my sister and me in the middle of the night one night to hear his voice over the short wave radio so we would know the voice of a madman. Some of my most cherished and admired friends are Holocaust survivors or children of Holocaust survivors. Now, because I believe in a woman’s right to control her own body, to be equated with Hitler is a little much. Fundacja Pro, the organisation behind the billboard, said that it wanted to remind Poles that abortion was first introduced to Poland during the Second World War by the country’s Nazi occupiers as a means of limiting the population of a people they deemed inferior. One of Europe’s most devoutly Catholic countries, Poland now has some of the strictest abortion laws in the EU, and any attempt to have them liberalised arouses furious and passionate debate. “It was Hitler who first introduced abortion to Poland, and in several days it will be the anniversary of that event. “In this context it is worth recalling the words of Pope John Paul II: ‘History teaches us that democracy without values easily turns into open or thinly disguised totalitarianism’,” Fundacja Pro said in a statement. Values? Whose values? Does the value of a woman count? Does a woman still have a right, any right, to determine what happens to her own body? Or are only a few pontificating men allowed to decide what our ‘values’ should be? (T)he use of Hitler, along with the torn foetus pictures, has already incurred the wrath of critics. Nazi Germany inflicted horrific levels of death and destruction on Poland, so any perceived attempt to hijack that suffering for the sake of a political or ethical agenda can be viewed with distaste. Well, yes. One wonders if decency is a word the creators of this campaign can even begin to comprehend. Hitler abortion poster sparks anger in Poland – Telegraph.